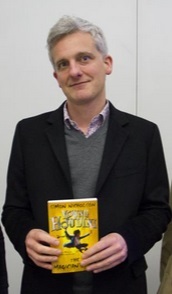 Simon Nicholson is a children’s television screenwriter and author. His television credits include Fireman Sam, Tracy Beaker and Bob the Builder. Simon writes for both the UK and international markets and has been nominated for BAFTA and RTS awards. 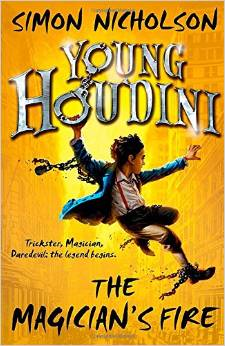 His latest novel, The Demon’s Curse, is second in the ‘Young Houdini’ series and publishes in June of this year. Simon describes himself as a ‘maker and a writer, not a theoretician’. His books are plot-driven with story as their ‘line through the sand’; his own writing process is one of following the logic of an idea. Simon began his career in the theatre. As an assistant director, he worked for various companies, including the Unicorn Theatre, The Manchester Royal Exchange and Theatre Centre. His first job was with the Royal Shakespeare Company. He recalls how working with actors was a useful experience. Good actors, like writers, are constantly asking questions about the characters they create. Drama, however, is about conflict and, by necessity, conflict doesn’t always produce likable characters. Later on in his writing life, the producers of TV shows sometimes worried about protagonists as not being ‘likeable’ enough. One of Simon’s solutions was to insert a second scene, a ‘feed the cat’ moment in which a protagonist does something kind, or, in the case of Young Harry Houdini, spends his hard-earned cash on a birthday cake for his friend. The second scene device doesn’t necessarily need to be much, just a tweak to create the desired effect. After working in the theatre, Simon got a job as a writer with the Jim Henson Company. He describes the Henson philosophy as having a ‘passion for making wonderful worlds’. The principle was this: if you are a child, no matter how difficult your home life is, there is a little box in the corner of the room. This box is a thing which can be used to make the world a better place. Simon refers to himself as being one of Henson’s ‘diluted disciples’. The wonderful world of children’s television is nevertheless a financially minded one and the ability to develop what Simon refers to as a ‘subtle imagination’ was an important part of working in that world. He became familiar with the business of ‘notes’ at this time, and remembers the impact these demands placed upon the writers who were constantly asked to tweak, re-assess or re-invent their ideas. A very demanding process. After sending speculative scripts out to a few industry contacts, Simon began working as a writer on shows such as Bob the Builder, The Hoobs and Tracy Beaker. Gradually, and from within this tightly-managed world of script writing, the desire to write a book emerged. He had a great idea for a plot and wrote some opening chapters – it was picked up by an agent straight away. However the book was never completed and, in hindsight, Simon believes this was a good thing as there were too many technical problems within the plot. The Houdini stories, however, were different. He had the necessary ‘burning idea’ but also a structure. Each story was based on one of Houdini’s great escapes and framed like a murder mystery. Perhaps, suggests Simon, this clarity of structure and idea was influenced by the fact that during the time he was writing the first Young Houdini story, Simon and his family were living in Borneo. Such a change in environment can often refresh and focus the mind – with great results. The manuscript was emailed back to Oxford and was accepted and published as The Magician’s Fire, first in the US and this year in the UK. The Magician’s Fire has been selected for the Summer Reading Challenge. The second book in the series is published in June. We look forward to reading it. This entry was posted in Winchester Reading Series 2015 and tagged Bob the Builder, children's author, Houdini, Jim Henson, screen writing, Summer Reading Challenge, Tracy Beaker, University of Winchester, Winchester Reading Series, writing by Litmus 2015. Bookmark the permalink.